Overwatch would be a lot different if Pharah’s biggest fear while flying around wasn’t an enemy sniper but the hard impact of the ground below her. Overwatch forum user Spirit recently brought up the fact that Blizzard’s shooter would be significantly different if it had fall damage — maybe even unplayable. Imagine Pharahs that could damage or kill themselves if they landed too fast, or Winstons that could accidentally leap too far up and send themselves back to the spawn room. 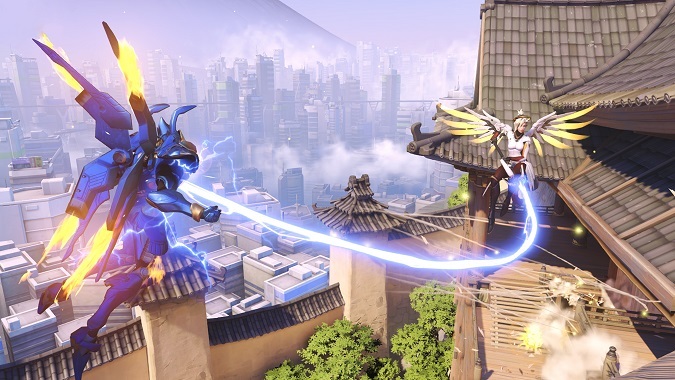 Game Director Jeff Kaplan says the team actually tried to implement fall damage for a while. “We ran into problems with characters like Widowmaker,” he explained. Widowmakers would grapple to high ground and have to wait until the cooldown was up again to return to the ground. Basically, fall damage punished high-mobility heroes and made the game over-complicated, according to Kaplan. They tried to apply it only to certain heroes, but the result was a messy set of rules that wasn’t very elegant. Thankfully, the game didn’t launch with fall damage and we can see the results of that. When there’s zero threat of vertical punishment, the maps can be built with that knowledge. Picture a map like Eichenwalde without the tall castle in the middle section, or imagine playing on that map where being up on top of the castle was risky. The freedom of being able to climb to high locations and drop down whenever eliminates most of the strategy behind movement. As a result, you can focus more on dodging incoming fire and positioning yourself in advantageous areas. Like the removal of scarce ammunition, the removal of fall damage lets Overwatch be a game about other things. It shifts the complexity to parts of the game that are more important and therefore allows you to focus more on those aspects. It would be hard to learn how to aim well on Widowmaker if you also had to worry about falling to your death, or how to jump properly on Winston if some jumps could end you. It wouldn’t work for every game, but it works well for Overwatch.